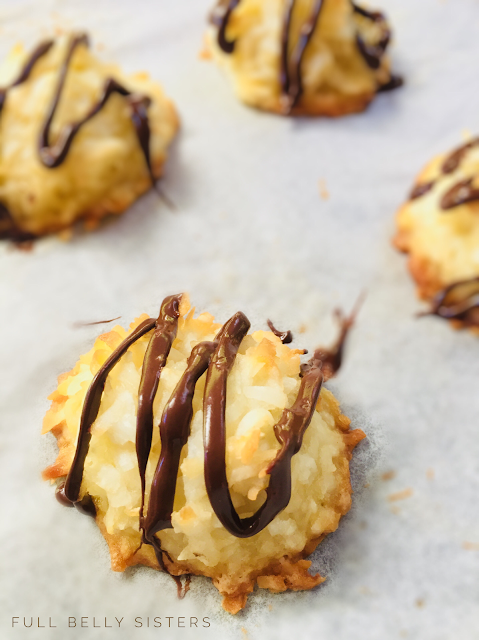 These Easy Coconut Macaroons are a lovely, delicious dessert that is—with just a few ingredients—simple to make. They're a perfect sweet treat alongside a cup of tea or on a holiday cookie platter! Welcome to the latest edition of Freaky Friday! In case you don't remember from my previous #FreakyFriday posts, this event is a when a group of food bloggers are each randomly assigned to another participant's blog; from there, we choose one recipe to make, taste, photograph, and write about. Best of all, I've been assigned to the wonderful An Affair from the Heart, a blog that I've followed for years now. The brain, cook, and palate behind the blog is Michaela—who happens to be the mastermind behind Freaky Friday! My assignment makes this foodie event extra fun this time around. Michaela, a mom of four (who somehow still looks like a teenager herself! ), creates dishes that run the gamut from easy weeknight meals to decadent comfort food to classic desserts. How would I ever choose? I've had my eye on her Crack Dip (LOL!) for a while; I decided to save that for my next book club meeting. The Deconstructed Guacamole Salad is basically my ideal meal...but tomatoes aren't that great, now that it's autumn in New York. I was almost 100% certain that I'd make Michaela's Oven Fried Chicken and pair it with her Honey Chicken sauce...but then something else caught my eye. 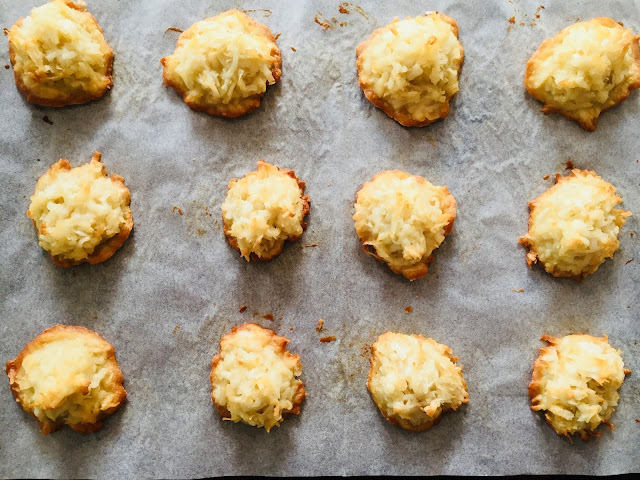 Michaela's easy Coconut Macaroons. I knew right away that I had to make these. You see, any coconut dessert reminds me of my father. He used to talk about how his mom made chocolate-dipped coconut patties for his Easter basket, about how he'd always choose chocolate cake with coconut frosting for his birthday; he loved Mounds and Almond Joy candy bars; he adored pina coladas and coconut ice cream with chocolate sauce. He loved everything coconut and everything coconut reminds me of him. He died just a few months ago, after a years-long battle with Parkinson's Disease. It was a huge loss and I miss him terribly. A couple of weeks ago, we held a memorial for him, a Celebration of Life. Friends and family came together to remember my father, to laugh about his funny stories, to cry over his loss. It was a wonderful, healing event. And it was very much a celebration—just as he wanted it to be. We even had a sundae bar, since my father loved sweets so much. And of course, we had coconut as one of the toppings. We had plenty of coconut left over from the sundae bar. And now I knew exactly what to do with it! The perfect sweet treat, in memory of my father. Preheat oven to 325 degrees. In a medium bowl, combine coconut, sugar, flour, and salt. Mix well. In another bowl, beat egg whites with the vanilla until fully blended. Pour the egg mixture over the coconut mixture. 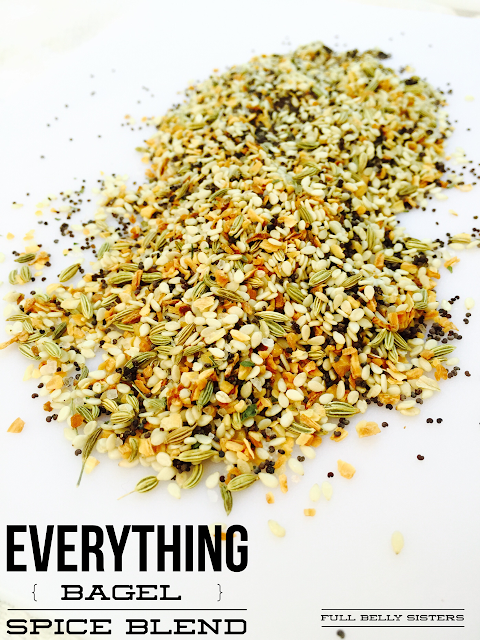 Mix until fully combined. Drop by rounded tablespoons onto a parchment-covered baking sheet. Bake for 25-27 minutes or until golden brown. Let the cookies cool on the baking sheet for a couple of minutes, then carefully remove them to a wire rack to finish cooling. Once completely cool, melt chocolate in a microwave or double boiler, then drizzle or pipe over the cooled macaroons. My father would've loved these sweet, chewy-yet-light cookies. I wish I could have made them for him. 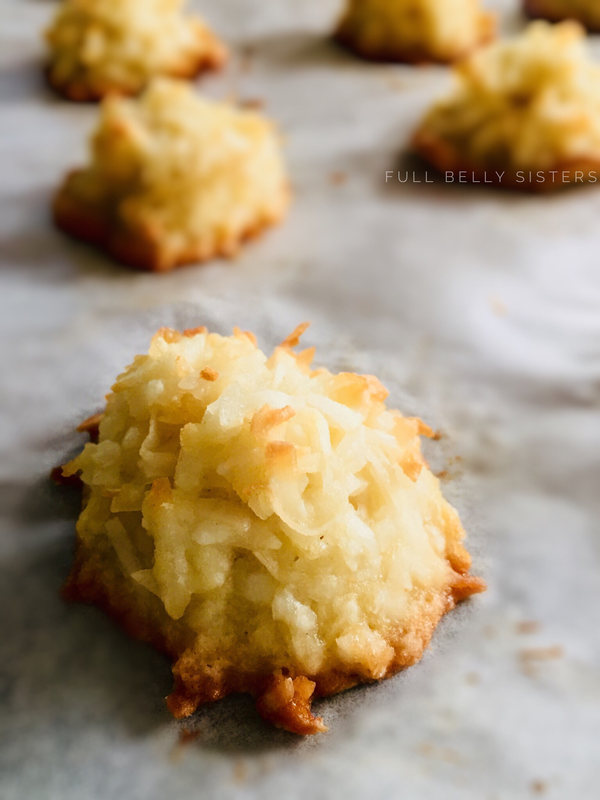 I'm grateful that I had a lifetime of memories to reflect on, while I made and enjoyed these sweet coconut cookies. Make sure to check out all the fabulous Freaky Friday recipes! These macaroons look so tasty! Lovely and easy to make too, that chocolate on top just makes it perfect! Yep, definitely making these tomorrow. I just checked and have everything I need so it's time to make some cookies! My hubby will love these! These look like quite the yummy treat! I'm thinking they'd be perfect for a Christmas cookie exchange! Macaroons are always a hit!! 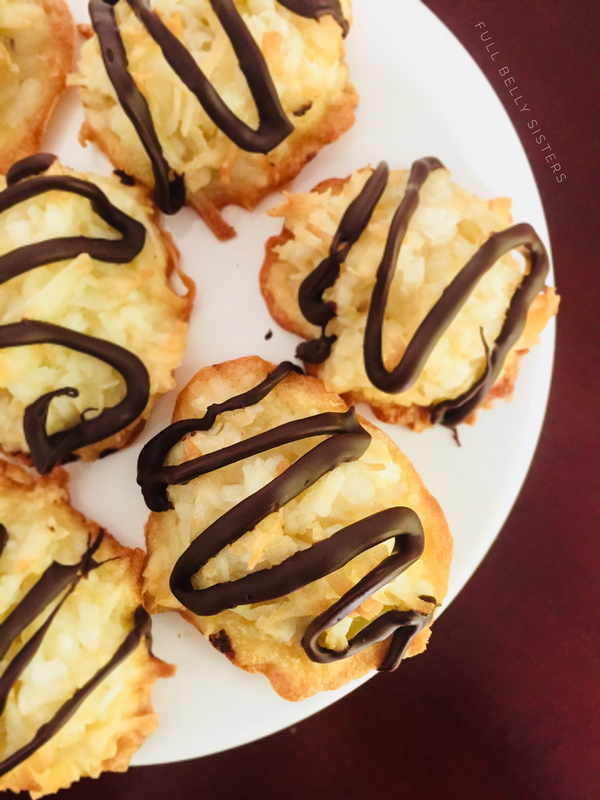 I love coconut macaroons! These look absolutely wonderful! These turned out simply beautiful! 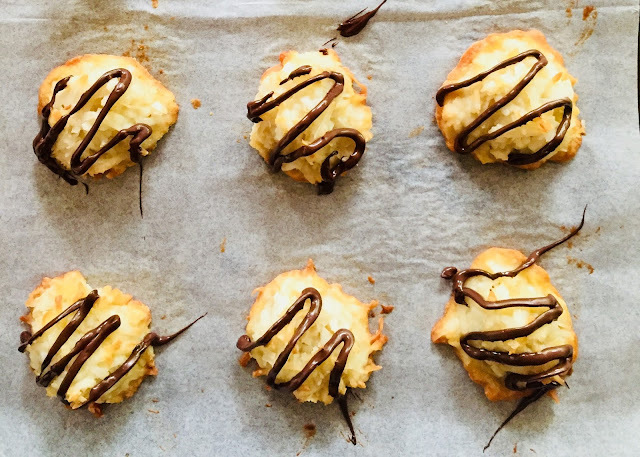 These macaroons sound so easy and look so delicious! I love that they're drizzled with dark chocolate! How perfect are these!?!? They sure would make for a great addition to any cookie tray! Im thinking way ahead to the holidays for these little beauties! Gosh do these babies look mouthwatering good! I love macaroons, and these look delicious! I hope you are doing alright, I know these past weeks have been rough. Love to you and your family. Delicious! This is my husband's favorite cookie. I'll have to make a batch for him. My mother in law is dealing with Parkinson's. It's heart breaking to watch a loved one deal with such a horrible disease. Hugs, to you and thanks for the warm thoughts of your dad. These are GORGEOUS!!! I have never had a Macaroon before. I need to try this recipe! You picked on delicious cookie. I just love macaroons and would love a couple right now. What a great tribute to your father. I lost my dad several years ago and it's bittersweet the way some things just pop into your head that remind you of them. Justine, the fact that these cookies were any part of your memorial to your dad makes me so glad you chose this recipe. I know how much you loved him. And I know he smiles down on you constantly. You are an amazing woman, and I am sure he is so proud of you.